The Casibari Rock Formations is a collection of diorite boulders, situated close to the village of Paradera. Not far to the east you will find the Ayo Rock Formations. Both places are worth visiting when you are looking for sights to see in Aruba. The Casibari Rock Formations are grouped and piled and here and there you will find some rocks a little bit further away from the center. Some people see certain shapes in the rocks, like birds and dragons. The rocks are situated in an area full of cacti and other vegetation. Lizards, iguanas, and burrowing owls can be seen at this place too when you are lucky. About 1.5 kilometers to the north you will find the Hooiberg or Haystack hill, a 564 feet high volcanic formation that is the second highest hill in Aruba. On a clear day, you can see Venezuela when you look to the south. Just like the Ayo Rock Formations, the Casibari Rock Formations are filled with mystery. Until now it is unclear how these rocks ended up here exactly, and it is unknown why these boulders are grouped in the Casibari area. It is unknown whether they had a certain function a long time ago. Their presence might be very well connected to the Arawak indigenous peoples who came to Aruba from South America a long time ago (2000 BC) and left drawings at the boulders of the Ayo Rock Formations. The Casibari Rock Formations are the perfect place for short hikes. Exploring the huge wind-carved boulders is a hiker’s delight. The tunnels and narrow ledges make climbing the rocks exciting and fun for all ages. The top elevation is at 140 ft and the change of elevation is only 20 ft when you are exploring the surroundings of the diorite boulders. Compared to the Ayo Rock Formations, the Casibari Rock Formations are a little bit easier to explore as stairs and handrails have been created at the site. From the top, a beautiful panoramic view is being offered to you and on clear days you will be able to see the coastline of Venezuela. We recommend visiting the Casibari Rock Formations early in the morning or late in the afternoon. Although the wind might bring you some comforting relief, the temperature around noon is just too high and there is no shade. Make sure you bring plenty of water when you plan to go hiking around the rocks. Bringing a hat or cap, sunglasses, proper clothing, sun lotion or sun block and proper footwear is recommended. Remember that the Casibari Rock Formations can be a little busy with tourists flooding the place, so make sure you time your visit well. 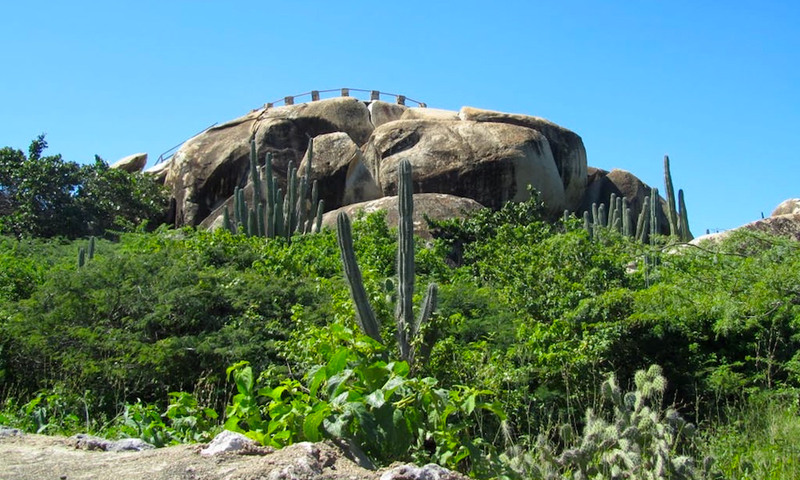 At the Casibari Rock Formations, you will find the Casibari Coffee & Souvenir Shop where you can take a break before or after you explore the boulders. Restrooms are available at the site.